Accommodations: Sleeps up to 12 guests in 6 staterooms. United Yacht Sales New Jersey would love to guide you through a personal showing of this 153' Feadship 1997. 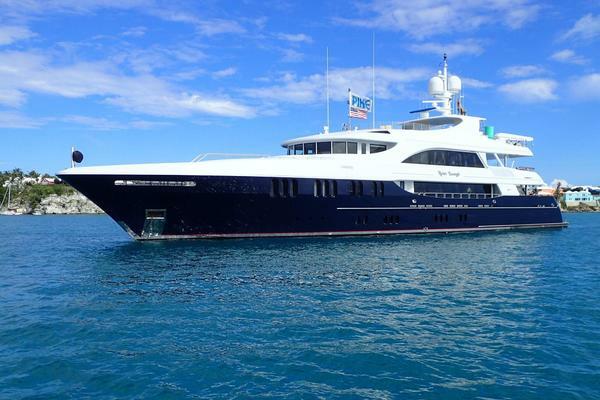 This yacht for sale is located in Fort Lauderdale, Florida and priced at $14,900,000. For a showing please contact us by filling out the form on this page and we will get back to you shortly! GENERAL OWNER'S SUITE: On the Main deck forward is the Owner’s full beam stateroom with king-size bed, separate office, spacious vanity, large walk-in dressing room and HiFi/TV cabinet. The bathroom includes: shower, toilet, bidet, double wash basin and Jacuzzi bathtub encrusted with Persian Red Travertine, Rose Aurora and white Thassos marbles. GUESTS: The five guest rooms are located amidships where motion is a minimum. Each guest stateroom has its own individual and carefully coordinated color scheme and en-suite baths with either a bath or shower decorated in Botticino Classico marble. Two guest rooms have queen size beds and the three other guest rooms have twin size beds. All guest rooms meet in a spacious lobby. CREW: Below the Main deck are the crews’ quarters for 8/10 crew members with the mess room and laundry facilities. SUN DECK There is a Jacuzzi on the outside seating and large sunbathing area on the sun deck. BOAT DECK On the bridge deck are the wheelhouse, which is decorated in teak with a great selection of communication equipment, Captain’s cabin, pantry, bridge deck lounge with sofas and easy chairs, coffee tables and a free standing bar topped with Azul Macauba marble and fronted by green leather trim with mahogany strips. The lounge has electric sliding doors that lead to the open aft deck and the large windows make this a wonderful place to relax and enjoy the surroundings. MAIN DECK On the Main deck forward is the Owner’s full-width stateroom, the galley with Corian counters and hand-made Makkum tiles and pantry, the breakfast bar, dining room with seating for 10 guests around a Mahogany table, and the glass-enclosed stairway which leads to the guest staterooms. The main lounge with sofas and seating covered in pale green silk form a circle with the tablesat the hand-woven carpet. The electric sliding doors aft lead to the open aft deck and swimming platform. LOWER DECK Below the Main deck are the crew’s quarters, the mess room and laundry facilities, the 5 guest staterooms with en-suite bathrooms. Three queens and two twins. One twin was converted to a queen in December 2017. Also on the lower deck is the engine room with an integrated but enclosed control room and large aft peak storage.